Today ASPI’s International Cyber Policy Centre launches the second edition of its Cyber Maturity in the Asia–Pacific 2015 Report . It analyses the cyber maturity of 20 countries, representing a wide geographical and economic cross-section of the region. 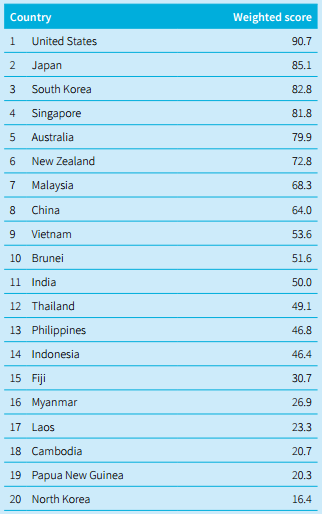 For a more holistic picture of regional developments, this year’s maturity metric has expanded to incorporate five additional countries: Vietnam, Laos and Brunei in Southeast Asia; and New Zealand and Fiji in the South Pacific (see image for rankings). With these additions, this study now assesses the entire Association of Southeast Asian Nations (ASEAN) grouping and seven of the ten ASEAN dialogue partners. Throughout the year, awareness among regional governments of cyber threats and opportunities remains uneven. Governments that prioritise the development of coherent cyber policy frameworks understand that those frameworks are necessary for their countries to advance digitally. Others, specifically South Korea and the US, have also been subject to incidents  in cyberspace that have critically affected their economic and national security. Those left behind are usually struggling to develop the required infrastructure to open up cyberspace to more of their population, challenging their capacity to develop adequate policy frameworks. However, it’s critical that those frameworks are established as cyber infrastructure is developed and not ‘bolted on’ retrospectively. The report will be launched at a free ASPI event with special guest David Irvine AO, tonight at 5.30pm at our Barton offices. Registration and information here .